Prateek Nagalia did his Schooling from Brightlands, Dehradun and his B Tech from Amity University. After completing his education he started working with his father. He has the distributorship of Exide Batteries and CEAT Tires. He also has the C & F of Polar Fans and Microtek Inverters and is also the co founder of GIP, Dehradun. In 2013 he started the dealership of Royal Enfield and is the Managing Director of the Royald Enfield Store, Dehardun. Process management is the ensemble of activities of planning and monitoring the performance of a business process. The term usually refers to the management of business processes and manufacturing processes. "I was born and brought up in Dehradun and after completing my B Tech I started working with my father. 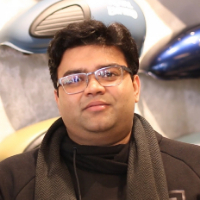 I am the Managing Director of Royal Enfield Store, Dehradun and working there since 2013."